Yesterday, we celebrated Edward's 14th birthday! As we thank God for this sweet kid's life, we wanted to share this blog post we wrote a few years ago about him and his brother a few years ago, and their struggle to leave street life behind. Jose Daniel visits his brother Edward in May 2013. On Saturday, Edward celebrated his first month with us at the Micah House. The joy that this chirpy nine-year-old brings to the house is absolutely infectious! Even when one of the other Micah boys is having a puberty-induced “bad hair day," this little guy can bring a smile to his face. 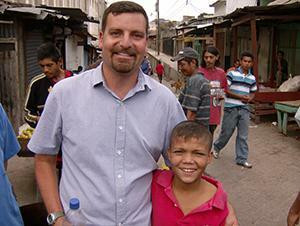 Michael chats with Jose Daniel during street ministry in 2008. As I watch little Edward joyfully taking in everything the Micah Project has to offer, I can’t help but to have “what if” thoughts about his brother Jose Daniel. Our dear friend Carolyn Rogers captured this street boy’s soul in a painting of him that hangs in my office: clutching his bottle of yellow glue, looking downward with an expression that reflects the empty solitude of life as a street kid. The Micah family has always loved Jose Daniel fiercely, and we worked for years to coax him off the streets and into the Micah house. We invited him into the Micah House every time he showed up at our door, let him take a shower, fed him a hot meal, gave him a new set of clothes to replace the rags he was wearing. 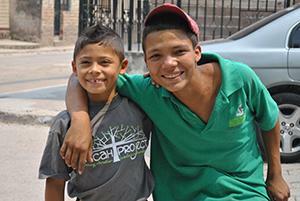 We invited him on weekend outings with us, showing him the world beyond the mean streets and alleyways of Tegucigalpa. We have asked people to pray for him and have pleaded with him to leave the streets behind. For a few months in 2007, we were convinced that he was just a day away from leaving the streets behind for good. But that day never came. 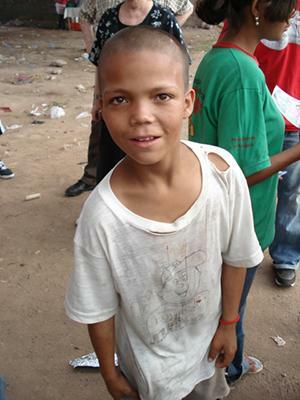 Jose Daniel on the streets in 2007. When people visit our ministry, they inevitably ask me how we get a boy to leave the streets and join the Micah Project. For the life of me, through 15 years of ministry to street kids, I’ve never been able to figure out why a kid like Edward will leave his glue bottle behind and decide to become a full-fledged member of the Micah family, while his brother Jose Daniel will come SO CLOSE, only to pull away at the last minute. I’ve read lots of books, studied other street kid programs around the world, had lots of real-life experience with boys that have made the decision to come off the streets…and so many others that don’t. I have yet to discover a magic formula that will make a kid join the Micah House. Jose Daniel had stopped coming by the Micah House for a couple of years. As he hits nineteen, street life has given him a harder edge, and I guess at some point we just moved on, started investing our time in other kids. Now that his younger brother is a Micah boy, though, he has started visiting us more regularly again. He sometimes asks for food or a new pair of shoes, but what I understand most from his slurry, drug-hazed dialogue is that he has pretty much given up on himself. He just comes to check on his little brother, then he’ll pad his way back down the hill in search of a fresh bottle of yellow glue. Edward contemplates the painting of his brother Jose Daniel. 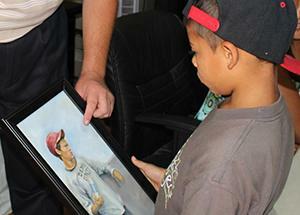 A couple of days ago, Edward was looking at the painting of Jose Daniel that hangs in my office. “Pobrecito mi hermano,” he said. “My poor brother. Isn’t there anything you can do to help him, Michael?” He walked over to my desk, gave me a hug and kiss and said, “Thanks for letting me be a part of the Micah Project.” Then he skipped off to play with his remote-controlled car. This little guy lives in a world where magic machines spit money out at you: of course he thinks that there must be some sure-fired way to get his brother off the streets! But that’s just boyish naiveté, right? I remember Jesus’ story of the elated father who went crazy when he saw his prodigal at a distance, hitched up his robe and went running down the road to envelope him with years of pent-up love. Pure, unabashed love. I don’t ever want to be the older brother who has shrugged his shoulders, hardened his heart, and erased the wandering boy from his heart. So…the next time I see Jose Daniel, I will begin a new effort to convince him let us place him in a Christian rehab program outside the city. I will begin to look at his life with the innocent confidence that Edward has…believing that transformation is still possible. I will begin to hope for him again.